Womens Fuzzy Boots - Our Furry Boots On Sale Now - 50% Off Your 1st Order! These cute fuzzy women's winter boots & booties from JustFab come in an array of fashionable styles and warm shades. We carry furry booties so your feet are sure to stay toasty and cozy when the temperature drops. Look for fuzzy faux suede for timeless and versatile winter footwear that coordinates with a variety of winter outfits. Our plush boots for women feature luxuriously soft and warm linings such as faux fur and are available at amazingly cheap prices. Faux suede furry boots look super chic worn with ripped denim jeans and a faux leather jacket. These adorable furry boots & booties feature delightful details like front lace up ribbons. Have fun coordinating our fuzzy women's winter boots with leggings, tunics and denim skinny jeans. When you want fur lined boots that are as stylish as they are comfortable, discover the unique shopping experience at JustFab. 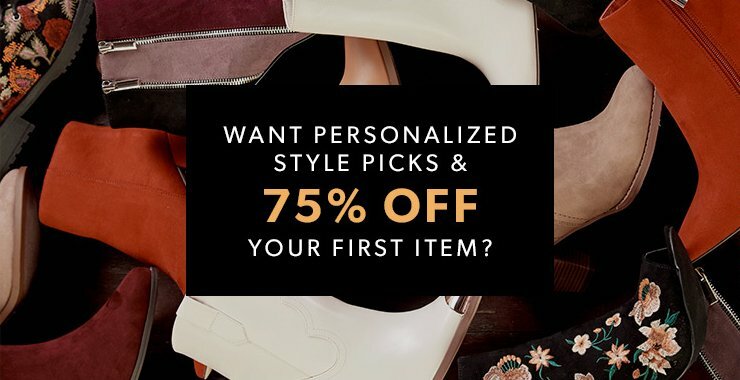 Each month, stylists handpick women's footwear and clothing finds that match your personal tastes, and signing up for JustFab is a cinch. We carry faux suede fur lined boots along with many other designer women's footwear essentials. Our plush furry boots, warm slippers and other online shoes will keep feet warm and looking great throughout the chilly seasons. For that added warmth during the winter, start with a fuzzie ankle length bootie with wood button side detailing and exposed outer faux fur trim. These comfortable fur lined boots are just the ticket to help you unwind after a grueling day. Fierce faux suede can feature a wraparound tie and tab detailing at the ankle. Look for plush boots with a classic short silhouette and adorable bow detailing up the back for fun lined boots that combine comfy with cute. Wear designer women's winter boots from JustFab and feet will stay dry and warm, thanks to plush linings like faux fur. Snuggle up with warm linings that peek out around the tops of the vamps. Look for faux suede in seasonal colors such as brown, black, grey and gold. Unleash your fashionista with plush boots emblazoned with sparkling sequins. Our inexpensive fuzzy boots are a perfect fit for all of your winter occasions, from cozy nights at home with the family to evenings on the town with friends. Consider these styles when you're putting together holiday or birthday gift lists for family members. Always on trend, faux suede furry boots look cute paired with leggings, a long tunic or a big slouchy sweater. Or coordinate them with denim skinnies, a cute plaid button-up and a cool hobo bag.